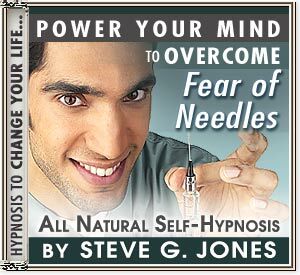 FINALLY overcome your fear of needles!!! The needle phobia taps into the brain's natural defence mechanism against blood loss, which will lower your blood pressure - causing faintness. Happily, my hypnotherapy to overcome fear of NEEDLES CD or hypnotherapy to overcome fear of needles MP3 can remove this unconscious response quickly and comfortably. After using the Overcome fear of Needles hypnosis MP3 or Overcome Fear of needles Hypnosis CD, you will notice immediately that even thinking about an injection is easier. And when you go for an injection, you will be amazed that you are much more relaxed than you ever were. (We can't promise you will actually like injections though!) Being uncomfortable around needles is normal - needle phobia can be cured.